Students love a bargain, and they are good candidates for just about anything you're selling — especially at the beginning of the school year when students are moving in. You can post flyers around the school and create listings in the classified sections of college forums. 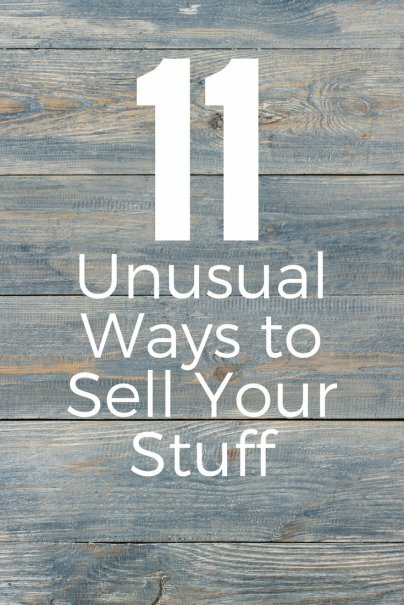 If you are selling locally, encourage your buyer to pick up the item at your place; once you get them in the door, they might want to buy other things. (This worked a charm for me when I was selling everything I owned.) Of course, be prudent about the circumstances around strangers coming into your home; by taking precautions like having a friend over if you're alone. You can do all kinds of things with the raffle concept. You can raffle off individual items (usually of higher value), as well as “kits” or “baskets” of related items of a theme (for example “kitchen” or “toys”). And depending on what you're raffling off, you can visit local clubs or specialty groups to raffle off some of your related “kits” (for example your bike and accoutrements might be of interest to members of a local cycling club). If you want a safe hands-off approach to selling the lot, a living estate sale is for you. There are organizations popping up everywhere offering this service; people come to your home and catalog everything to market and auction items off. They deal with the buyers, collect payments, and arrange pick-ups. Invite your friends (and friends of friends) over to do as the name invites! These are big in Europe, where people gather to sell their wares out of their cars (usually on a blanket or table beside the car). You pay a small fee for your slot, which often goes to the hosting school or church. I know somebody who created a website with pictures and prices of everything they were selling, then promoted the website locally with flyers etc, as well as online with social media. They also used the site as a referral point for eBay and Craigslist listings, thus giving buyers more information and employing cross-selling strategies. For specialty items like fishing gear and mountain biking gear, use the classified section of an online forum related to the item you're selling. Hopefully you'll get professional “garage salers” in; spot 'em and ask them to make an offer for everything. Expect to pretty much give it away. But if you want your stuff gone, there might be a simple pleasure in just watching somebody take it all. You can use Facebook in a few ways to sell your stuff. I've had success with simply posting a status update with various items for sale. You can also find dedicated Facebook groups for selling by performing searches like “Buy or Sell in [insert the name of your town]”. Poshmark hosts real-time themed selling parties which you “attend” on your iPhone. Create listings with your phone to fit the event's theme (such as designer handbags, bold accessories, skirts & scarfs, etc). When your item sells, Poshmark handles the payment and sends you a pre-paid pre-addressed shipping label (to anywhere in the US). They'll deduct a 20% commission fee from your earnings for this service, and it's currently only available to iPhone users in the US. Rumgr is a location-based marketplace that allows you to list your items from your smartphone and shows your posts to people living in your area. Do you have any weird ways to sell your stuff? Someone in our small town started a Yard Sale Facebook page. People list what they want to get rid of and it works very well. I've found great bargains that way. Caution on the raffle idea, in most states in the US this is a form of gambling and requires a raffle license if it's allowed at all. While in most cases no officer or DA would actually pursue this, but if somebody reports it they may be obligated to do so or may set an example using you. Try doing this with a well advertised event. (They all ready paid to spread the word so you won't have to). We've also sold things durring educational fairs and at Native American Pow-Wow's. I've seen a lot of people selling things on Facebook. I guess it works best if you have most of your local friends on there and they have their local friends, so things can reach an even wider circle with just a few likes.